1. Inspect both the dorsal and the ventral surfaces of the wings under 400x magnification for the presence of single spots (mwh or flr phenotype) or twin spots (a mwh clone adjacent to a flr clone). 2. Note the position of the spots according to the sector of the wing (see Fig. 1). 3. Score clones only in the distal wing compartment. Record the size of each spot (the number of affected cells), its type (whether it is a mwh or flr spot, or a twin spot), and its frequency (see Note 2). The classification of small spots consisting of one or two affected cells poses some problems. Practice is needed to detect small single spots. Because they are more frequent in untreated controls, it is important to differentiate true mutants from developmental disturbances in trichome pattern formation (see Notes 3-5). 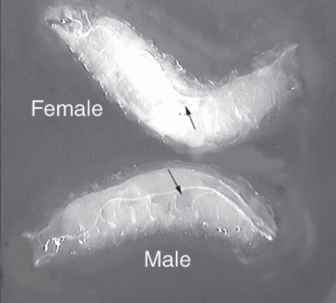 mwh: Classify as a mwh clone all cases in which a wing cell shows a mwh phenotype (i.e., > three hairs) (see Fig. 2). Do not count groups of cells showing two hairs without any occurrence of one or more cells having three hairs. In cases of one three-hair cell alongside one or more cells with two hairs, count all cells as mwh (see Fig. 2B). Fig 2. Different types of clones and their variations: (A)Small single spot with two cells expressing mwh phenotype; (B) large single spot with five cells expressing mwh phenotype. (Note that this is a spot that contains just one three-hair cell alongside four cells with two hairs. ); (C) large single spot with six cells expressing flr phenotype; (D) twin spot with 30 cells expressing mwh phenotype alongside 30 cells expressing flr phenotype; (E) twin spot with 14 cells expressing mwh phenotype and 8 cells expressing flr phenotype; (F) twin spot with 4 cells expressing mwh phenotype and 4 cells expressing flr phenotype. and cells containing one or more two-hair cells, as in this case, cells with two hairs are considered as mwh (see Fig. 2D,E,F).